A ‘Fianna Fail Are Criminals, Drink Drivers & Tax Cheats’ Poster from 2003 produced by Working Class Action (WCA). 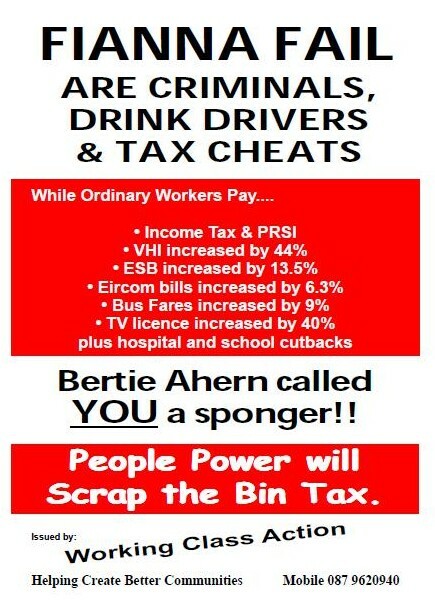 These posters were produced in reaction to Bertie Ahern stating that people who opposed the bin Tax were ‘Spongers’. They appeared all over Dublin at the time, although many were allegedly torn down (possibly FF or indeed souvenir hunters). Working Class Action were a Left Wing Dublin based campaign group. They were active in the Anti Bin Tax campaign. Amongst those involved in Working Class Action were Cieran Perry who was elected to Dublin City Council in 2009 and Joe Mooney. Both stood in the 2004 Local Elections.